Search engines favour (place higher in their SERP’s) those pages that give them the right signals. SEO may seem from the outside to be a rather mysterious and arcane art but getting the right combination of SEO success factors on your page will place your page higher. SEO is all about ensuring that your content works hard to send the right message to achieve that ranking. You have to be seen to get clicks. In recent times the search landscape has changed dramatically and the factors that send these right signals have changed. In a post Penguin/Panda world you need to change your pages to keep up. No longer will it work to over-stuff with keywords or have a multitude of inbound links. Search engines have become discerning and reward quality not quantity. So many changes have produced a corresponding wave of opinion and advice so it is always good to find a source of consensus and authoratitive opinion. 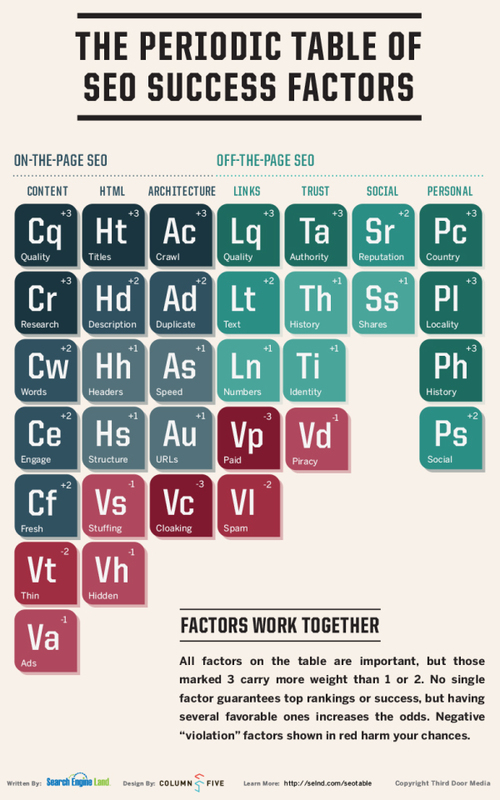 Search Engine Land have just updated their “Periodic Table of Ranking Factors” and interestingly they have renamed it the Periodic Table Of SEO Success Factors . The new name reflects the inclusion of several items that do not effect your ranking but do help to achieve the all important click. Think “Inbound marketing” not just SEO. Have a look at the table below and see how you pages, content and strategy measure up. Ad. A new element covering duplicate content was added. – the editors felt it was so important a factor to consider that it comes onto the table with a +2 weight. Ti – new element added covers what the editors decided to call “Identity.” This emerged from discussions about the growth of authorship, the ability especially with Google to definitively link a story with a verified author. When called “Authorship” in the survey, respondents felt it should come on at +2. The editors took a more conservative view, bringing it on at +1. Lt (Links) covers the impact that text within a link, anchor text, has on rankings. This has long been considered one of the most important ranking factors by SEOs, though search engines have long said or hinted at that they have the ability to determine what a link is about by other methods, such as surrounding text. Respondents thought the previous weight of +3 should drop to +2. The editors also felt dropping the weight might put a better focus on the link factor that is far more important, link quality (Lq). Ph (History) covers the impact someone’s personal search history has on rankings. Previously weighted +1, respondents felt it should go to +2. We’ve gone higher to +3, given that search history has such a huge impact on the results that people see. In addition to the Search Engine Land editors the new table was compiled with the help of some 200 comments and contributions that were received via a survey. Later in the year will see an update to the Semoz biennial, ranking factors survey which I expect will see a similar shift towards quality over quantity (links and keywords) and increased importance for Social and History elements that reflect your community engagement. As ever if you would like any help or resource in getting you SEO success factors right for your business please get touch.